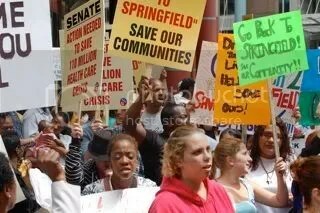 More than 1,500 demonstrators march on the James R. Thompson Center calling on the state Senate to return to Springfield and overrid Gov. Blagojevich's budget vetoes. 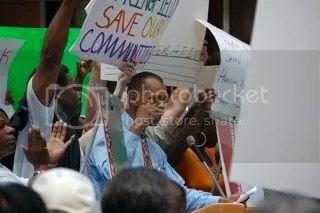 Chicago to urge Senate President Emil Jones (D-Chicago) to return to Springfield and restore more than $43 million to the state budget for alcohol and drug abuse prevention, treatment and recovery support programs. Governor Rod Blagojevich recently vetoed the money, and the Illinois House overrode that veto last week. “If the Senate fails to override the Governor’s veto, the prevention and treatment system in Illinois will throw more than 42,000 people out of care, igniting a health care crisis,” stated Sara Moscato Howe, CEO of the Illinois Alcoholism and Drug Dependence Association (IADDA). 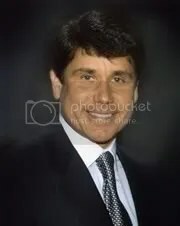 Blagojevich cut $58 million from addiction treatment services and also line-item vetoed money from specific programs: victims of domestic violence, women returning from incarceration, youth treatment, youth in the court system, and women receiving federal Temporary Assistance to Needy Families who require treatment to be employed. Haymarket Executive Vice President Anthony Cole addresses marchers. The House was able to override only $43 million of the vetoed money. If the Governor’s cuts remain, the Illinois Department of Human Services-Division of Alcoholism and Substance Abuse will also lose $55 million in federal matching funds and witness its $253 million annual budget fall by $110 million, or 43%. A 43% budget reduction will eliminate treatment for 42,140 people out of 98,000 currently served by state-financed community providers, Moscato Howe estimates. “These cuts will swamp Illinois hospital emergency rooms and local jails with thousands from the fallout of untreated addiction,” said Moscato Howe. Demonstrator express their frustration with the state political leaders. incarceration of non-violent drug offenders, domestic violence, on-the-job accidents, lost worker productivity, school drop-out rates, teen pregnancy, and traffic accidents and fatalities are all attributable to untreated addiction, says Moscato Howe. Additionally, the loss of the Federal dollars will eliminate the state’s community-based prevention system, because it will lose more than 85 percent of its existing funding. “Without the Federal money, every community-based prevention provider will be shuttered,” said Moscato Howe. “We urge Senator Jones to return to Springfield and override the Governor’s vetoes,” said Moscato Howe. Pastor Ray Mosby of Mt. Olive Missionary Baptist Church in Robbins, Illinois, speaks to reporters. Blagojevich and the Illinois General Assembly to restore more than $55 million to the state budget for alcohol and drug abuse prevention and treatment programs. The money was vetoed by the Governor last week. “If the Governor’s budget cuts stand, the prevention and treatment system in Illinois will be crippled, throwing more than 42,000 people out of care,” stated Allen Sandusky, Board President of the Illinois Alcoholism and Drug Dependence Association (IADDA). “The Governor and General Assembly must set-aside their differences and restore the funding,” said Sandusky. IADDA Chairman Allen Sandusky addresses reporters. “Cuts of this magnitude will expose Illinois hospital emergency rooms and local jails to the financial and human fallout of untreated addiction this year and years to come,” said Sandusky. Currently, untreated addiction costs the State of Illinois $3 billion a year. Increases in health insurance rates, incarceration of non-violent drug offenders, domestic violence, on-the-job accidents, lost worker productivity, school drop-out rates, teen pregnancy, and traffic accidents and fatalities are all attributable to untreated addiction, says Sandusky. Shannon, a nurse and pregnant mother, tells reporters that treatment has kept her drug free for 4 1/2 months and has saved her life. “We urge the General Assembly and the Governor to work together to resolve the budget challenges and restore full-funding to Illinois’ substance abuse treatment system,” said Sandusky. 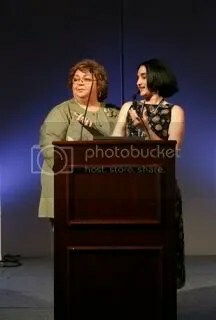 (Springfield, IL) — The State Associations of Addiction Services (SASS) bestowed its “Excellence in Leadership” on Illinois TASC President Melody Heaps in Orlando, Florida on June 2008. “The SASS award recognizes an individual who exemplifies excellence in leadership, one who advocates nationally in behalf of addictions treatment and prevention,” said Sara Moscato Howe, CEO of the Illinois Alcoholism and Drug Dependence Association. Howe, right, nominated Heaps and presented the award in Orlando. 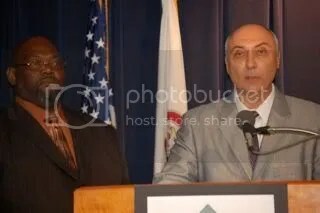 Heaps is founder and president of TASC, Inc., an independent, not-for-profit agency that provides access to treatment for certain drug-involved individuals in Illinois who are referred by criminal justice, corrections, juvenile justice, and child welfare systems. TASC conducts clinical assessments, matches clients with appropriate community-based treatment programs, and provides ongoing client monitoring and recovery management services. Under Ms. Heaps’ leadership, TASC has grown from a small pilot program in Cook County (IL) to a statewide organization that serves more than 20,000 individuals in Illinois each year. TASC also conducts research, advances public policy, and provides training and consultation services nationally and internationally. Recognized as an expert on improving system responses to drugs and crime, Ms. Heaps has served on numerous federal, state, and local task forces, committees, and councils dealing with criminal justice, substance abuse, child welfare, and other social issues. She was asked in 2003 to serve on the National Conference of State Legislatures’ Advisory Committee on the Treatment of Alcoholism and Drug Addiction. In 2001 she was appointed to the U.S. Drug Enforcement Administration (DEA) National Demand Reduction Advisory Council, and in 1996 was selected for the Drug Control Research, Data and Evaluation Committee of the White House Office of National Drug Control Policy. Additionally, Heaps has been appointed to a number of committees and councils for the federal Center for Substance Abuse Treatment (CSAT), including the Technical Expert Panel on “Financing, Cost and Access to Substance Abuse Treatment” in 2001, Partners for Recovery in 1999, and the National Advisory Council in 1994. A committee appointed by the SAAS President reviewed the award nominations and recommended that Heaps receive the award. Chicago, IL) — Since fiscal year 2004, Illinois has successfully rolled back recidivism rates from record levels, reduced the rate of new crime among parolees, slowed the prison population growth rate, and saved taxpayers more than $60 million, according to new state statistics. 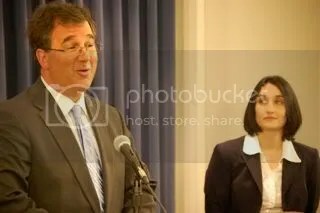 Governor Rod Blagojevich and the Illinois Department of Corrections (IDOC) reported at a press conference in Chicago on May 19 that the number of new convictions for crimes among parolees has decreased by over 18% from 4,567 in FY04 to 3,742 in FY07, the largest decline in state history. * Total arrests among parolees experienced a 23% decline from FY04 to FY07. * Participants in the Sheridan Drug Prison & Reentry program, which has been called a national model, have exhibited a 40% recidivism rate, lower than comparison groups. * The prison population has increased by only 4.5% since the end of FY02, which is the slowest rate of growth over any similar time frame since the Illinois Department of Corrections was established in FY70. * Reduction in repeat crimes has saved taxpayers an estimated $64 million in prison costs since 2004. The figures stand in stark contrasts to Fiscal Years 1989 – 2005 when the state prison population doubled from 22,000 to 44,000, and the recidivism rate increased to nearly 55% — meaning that 55% of all inmates released from prison returned to prison within three years. “The reduced recidivism of Sheridan parolees testifies to the value of well-funded of drug treatment and the need for continued drug treatment investment,” said IADDA CEO Sara Moscato Howe. (Springfield, IL) – The estimated number of Illinois residents waiting for alcohol and drug abuse assessment and treatment at state-financed facilities in 2008 rose 17 percent in, according to a report released at a press conference in Springfield on May 1. The report by the Survey Research Laboratory at the University of Illinois at Chicago surveyed 106 Illinois community treatment providers in December 2007 and revealed 7,541 people were waiting for some form of treatment, up from 6,467 in March 2007. Moscato Howe said the state must invest $41 million this year to provide care to the growing number of untreated Illinois residents, to decrease wait times, and to provide relief to community service providers burdened by escalating expenses. State Sen. Jeff Schoenberg (D-Evanston), left, is backing Moscato Howe’s call for additional money. Schoenberg is sponsoring legislation, S.B. 2886, to boost funding by $41 million in this year’s budget. Across the state, northern Illinois has the most people, 2,168, waiting for care. The fewest, 830, is in southern Illinois. The report also estimated that 595 youth are waiting for treatment. Central Illinois has the most youth waiting for treatment with 182 on waiting lists. The funding legislation’s fate is uncertain. 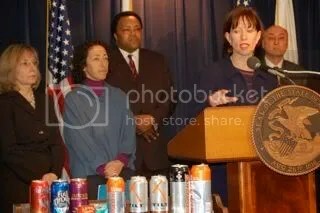 (Chicago, IL) — Advocates from the Illinois Alcoholism and Drug Dependence Association (IADDA) and State Sen. Heather Steans (D-Chicago), (below), pushed their legislative plan, Senate Bill 2472, at a press conference on March 24 to require warning labels on alcoholic energy drinks, such as Sparks, Tilt, and Bud Extra. “Miller Brewing and Anheuser-Busch are producing drinks whose packaging is indistinguishable from their nonalcoholic, teen-focused energy beverages,” said IADDA CEO Sara Moscato Howe. Alcoholic energy drinks, with brand names like Sparks, Tilt, and Bud Extra, contain not only alcohol but also caffeine and other stimulants. Moscato Howe cited the Tilt brand as a typical example of packaging that obscures alcohol content. Tilt packages its alcoholic energy drinks in a brightly colored and youthfully designed container that resemble nonalcoholic energy drinks (right). Additionally, the Tilt container displays the alcohol content in fine print. Sen. Steans and IADDA have a powerful ally on the issue–Illinois Attorney Lisa Madigan. A few weeks ago, Madigan told the Springfield State Journal-Register that the alcoholic energy drinks should be banned altogether. Additionally, Madigan joined 30 Attorneys General in a joint letter in August 2007 to the U.S. Alcohol and Tobacco Tax and Trade Bureau expressing “serious concern” on the drinks’ marketing practices. State Sens. Mattie Hunter, Maggie Crotty, Lou Viverito, Christine Radogno, Jacqueline Collins, Susan Garrett and Iris Martinez have joined as legislative co-sponsors. 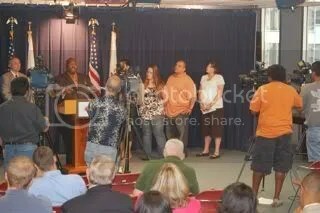 Illinois Alcoholism and Drug Dependence Association Board Chair, Alan Sandusky, speaks at Steans’ press conference.